The stories are legendary… errors made when selecting tattoos under duress, heightened emotions, weakened relationships, or substance influence. But in the end, you alone are responsible for your ink. What follows is a gathering of standout people that boast tattoos that everyone will take pictures of… just for all the wrong reasons. 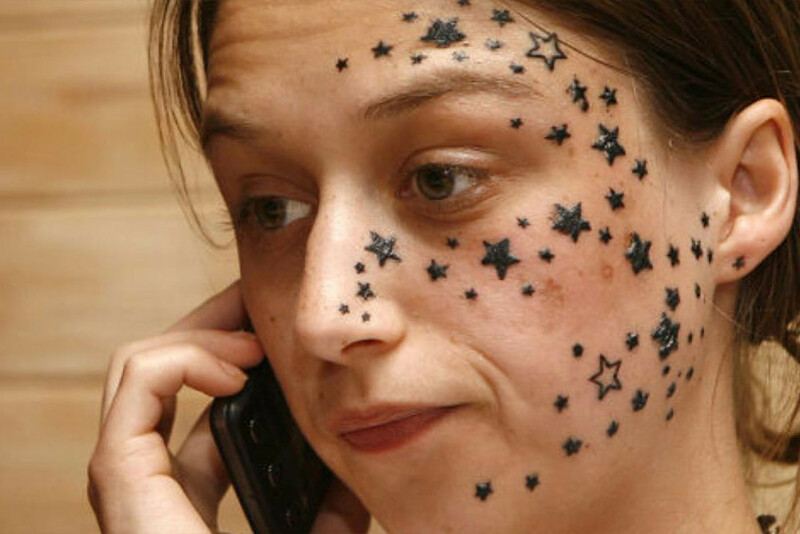 The undeniable top of the bad idea list goes to this winner, whose drunk-night-out ended with a fantastically poorly done night sky scattered across her mug. Clearly already on the phone planning its future removal before the morning’s end, her facial ink proves the hard truth: when in doubt, try it out with a Sharpie first. On the bright side, at least for the people around her the stars will be out every night. I wonder if there are any hidden constellations? probably not, that would take too much thought.